PLEASE DONATE TO YOUR LOCAL ANIMAL SHELTER! Answer Online Surveys For Money! "Chris is compassionate and caring, a real "dog whisperer"! She's helped us train our anxious, dog-aggressive rescued Golden-Retriever with amazing results. We love her photos and texts when we're out of town.What a peace of mind to know that someone who loves animals, like Chris does,is taking care of our Jack". "This is really a great service. We have 3 dogs and they all get so much attention and love from all the women in Chris's company. The pups are very happy and relaxed. It makes our time away from them much easier. Strongly recommend, very professional and wonderful people." "We are so happy that we found Pooches 'n' Whatnot. Chris and her team continue to do an outstanding job. They have cared for our cats on numerous occasions. Our normally reclusive tabbies do great with them ;). they go above and beyond to care for them and always keep us updated. We know they are in good hands with them." "We have been so pleased with the service that we received from the great team at Pooches 'n' Whatnot. From the first time they came to our house to meet us and our Golden Retriever, "Jake" through the weeks of service they have gone above and beyond. Especially when we have had last minute changes to our schedule Chris and her team have been very accommodating. Choose Pooches 'n' Whatnot and you will be able to relax and know your "best friend" will be very well taken care of." "I am the pickiest person in the world. When it comes to our 3 Chihuahuas. Nothing and no one is ever good enough. I've tried multiple dog sitting services and none of them satisfied us. As a matter of fact, some of the shenanigans were so bizarre, we ended up putting cameras in our home to see what was going on. Then Chris came along. We found her on-line and had to try yet another new person/service. Wow!! I cannot say enough great things about Chris; how well she cares for our "babies" and how well she maintains our house, and how much she loves the dogs. We trust her completely to be in our home, caring for our dogs. We travel often, between 2 and 7 day long trips, when we get home, the dogs ar not frantic for our attention, which confirms that she had provided them all kinds of love and attention during her visits. Her charges are much lower than the competition and frankly, she could hcharge more, especially for the care and services wshe provides. She is by far, the best thing we coudl have ever asked for! She is amazing!" "When I moved to the Naperville area a few years ago I was determined to find a highly reliable dog walker for my Puggle, "Dublin". As soon as I met Chris, I knew that she was the right choice. She truly has a passion for animals which is evident in her work. My dog lights up at the very mention of her name. She provides a very professional and dependable service. I would recommend her to anyone looking for a caring and trustworthy walker in the area." 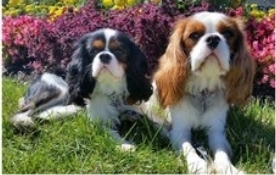 "I have been using Pooches for quite a while now and have been consistently delighted with the service. Chris is caring and loving to my 2 pups and her staff has been terrific. Chris listens, talks things through and is helpful in many ways. Including getting rid of the successful mousetrap for me." "Chris understands dogs and respects them. She truly cares. My pups adore her and other members of her staff. They have even given overnight care for my "kids". I have trusted them and they have been very respectful of may home. "I have used this service several times and couldn't be happier with the loving care my aging Mastiff receives! I even get texts and photos of him. Chris took the time to get to know him and all his "issues" with aging and I am happy to say that he took to her right away. Time was even taken to remove snow so that he had no problems finding his place to "go". They have even come to visit my dog on their own time! I highly recommend Pooches 'n' Whatnot!" "After not having much luck finding a dog sitter or my 7 month old Lab, "Jax", luckily I was able to find Chris! She was able to take my dog last minute for 9 straight days while we were away on our annual fishing trip. It worked out great and I can't recommend her enough to anyone needing a sitter. Do yourself a favor and contact Chris. You'll be very happy you did!" "We have been extremely satisfied with Pooches 'n' Whatnot. Our two big dogs, "Dash" and "Bauer", look forward to their walks. Chris and her ladies are off-the-charts for trustworthiness, care and friendliness. Our family and our dogs feel like they are part of the family. If you are looking for someone to trust with your dogs, look no further and give them a try. You won't regret it! Thanks Chris & Crew!" "Chris, you've done a super job with Sparky. You are very dependable and thorough. You are excellent at communicating about your visits with Sparky. I would recommend you to anyone." "I found Chris through the Yelp reviews. She watched our two little dogs while we were away for a week. I could not be happier with the service and attention she gave our dogs, especially considering it was one of the coldest week on record! She sent texts regularly to keep us updated, cuddled with the dogs and also left the house clean (including picking up after the dogs from the week outside, and did I mention it was really cold") Excellent service, great follow up and communication. I would highly recommend her service!" Visits are $18 for 20 min. and $20 for 30 min. walks and/or pet visits. Final cost may vary depending on number of pets to be cared for and specific requests. I offer both short and long visits but find that longer visits allow for more one on one "visit" time with your pet. I truly want to customize my services to fit your needs so you can choose one or the other or a combination of both. So whether it’s walking or refilling food and water dishes for your dog, or caring for your kitty's needs, daily and vacation visits provide an added peace of mind and provide essential human contact for them and are less stressful than boarding in most cases. Naperville area served: 60540, 60563, 60564 and others! Please call 630-802-9142 or email Chris today (massier@wowway.com) for more information about Pooches 'n' Whatnot pet care! I can set up a convenient time to meet and discuss your pets needs! YOUR pet visits and walks will be customized to YOUR specifications!